Whether the context is starting a business, buying a house, or signing on at a new job, it’s difficult to understate the importance of a contract. Even the word itself has wended its way into the American psyche as a thing of utmost gravity, with severe consequences if its conditions are broken. 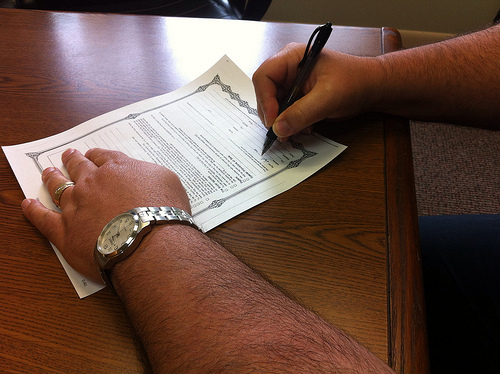 But, despite the significance many of us attach to these documents, sometimes a contract is disregarded all the same. If you’re a business and your client breaks their contract, what can you do? In the state of Pennsylvania, there are three basic requirements that need to be met before your business has a breach-of-contract case. It may sound almost too simple, but there has to be a contract, first of all. Secondly, said breach must be somehow demonstrable. The third condition is that the breach must have resulted in damages to the aggrieved party (you). Presence of a contract. Let’s immediately address the question of oral versus written contracts. While the former, in theory, carries the same weight and validity as the latter, oral contracts suffer from a total inability to be “proven” in court. Unlike words written on paper, words merely spoken are invisible and temporary. The bottom line is that written contracts are superior in terms of efficiency and provability. Now that that’s cleared up, in order to be valid, your (presentable) contract must have consideration. If a contract has consideration, both sides surrender a legal right, and both sides also obtain some desired (as opposed to unexpected) benefit. If these factors are not in place, the contract does not have consideration, it’s not binding, and your case is out. Demonstrable/material breach. The breach of contract must be two things: demonstrable, and material. You can think of “material” as a synonym for “significant” — that is, the breach impacts the contract in an important, meaningful way. There’s no hard definition of what constitutes a material breach, however — it’s decided by the courts on a case-by-case basis. The breach results in damages. These damages must be two things: they must be the direct result of a breach, and they must be reasonably foreseeable by both parties. (For example, a freak storm damaging correctly-applied siding is not foreseeable, nor is it the result of any failure to abide by contractual stipulations.) There needs to be a certain degree of certainty when it comes to claiming damages — not only should the money lost be a provable figure, alternative efforts to minimize damages must be taken up by the aggrieved party before damages can be claimed in court. If your business is the victim of a breach of contract, you may be eligible to collect damages. To assess your situation, contact Berkowitz Klein today, and let our attorneys bring their 25 years of experience to your case. This entry was posted in No Category on October 11, 2013 by Gerald S. Berkowitz.